This activity was given to address performance with visual scanning, visual perception, FMC (fine motor coordination), identification, cognition, and memory skills. This is a product that adheres to the bottom of the bathtub to decrease the risk for slipping while completing bathing activity. Preventing falls is of utmost importance with our aging population and falls in the bathroom/bathtub are some of the most common. Residents were provided with a small piece of theraband or a resistive hand exercising ball to address Lower Extremity/Upper Extremity strength and hand strength, impacting their performance with functional mobility, ADL’s, and IADL’s. They were also provided with a hand-out, outlining appropriate exercises to do with this equipment. Residents were also provided with a nightlight that is activated once there is insufficient light in a room. This is so important for safe ambulation in rooms with poor lighting and/or at night. Falls at night are very common as our aging population may try to ambulate to the bathroom. Adequate lighting from these nightlights will, hopefully, help to prevent this. Oral Health is such an important issue at any age and especially in our geriatric population. There are many factors, such as physical limitations, visual impairments, and cognitive impairments, that this population faces that may put them at risk for caries, periodontal disease, and oral infection. Many individuals are using an old toothbrush, or don’t have one, which may increase these risks. Decreased performance in this self-care task can have negative effects on numerous physiological systems. 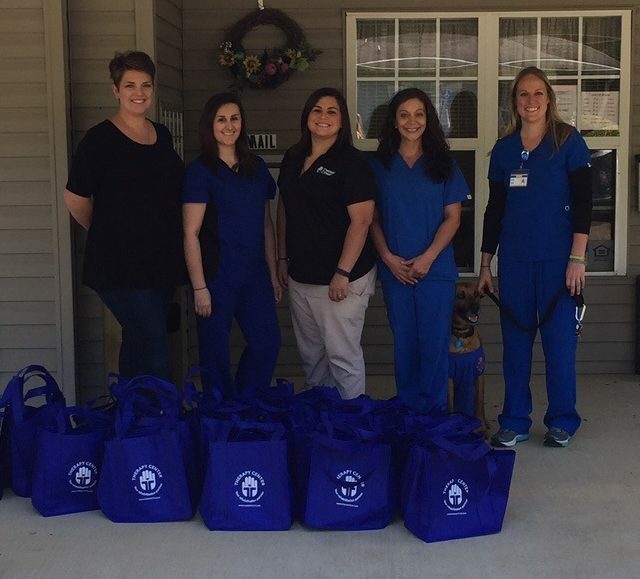 Therapy Center prides itself on the quality employees throughout the company, and this is just one example of the generosity of our teams. The senior citizens were so excited to have visitors coming door to door bringing them special goody bags. It was a beautiful day, and our therapists, including therapy dog Solo, were able to put a smile on so many faces. Want to learn more about our company-wide giving back campaign? Click here to find out how we contribute to causes we care about.